ROBERT HARLEY Autograph signature on Treasury Document. British (English) statesman of the late Stuart period. Queen Anne's chief minister and regarded by some as Britain's first Prime Minister. 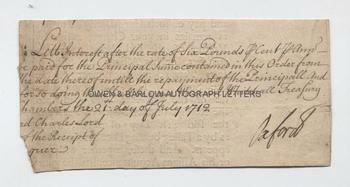 Autograph signature as the Earl of Oxford and Earl Mortimer on part of a treasury receipt. Whitehall Chambers, dated 21st July 1712. 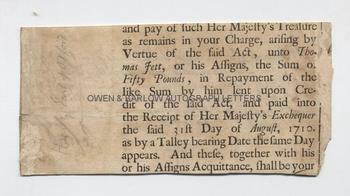 The document relates to the payment of interest on a loan made by Thomas Fett. On Treasury paper piece measuring approx 7 x 3.25 inches. Good. Robert Harley, from 1711 known as the Earl of Oxford and Earl Mortimer, began his political career as a Whig before defecting to the Tories. During the reign of William III, he was Speaker of the House from 1701 to 1705. From 1710 to 1711 Harley was Chancellor of the Exchequer and between 1711 and 1714 he served as First Lord of the Treasury and the First Minister of Queen Anne. His role was, effectively, that of Prime Minister, although Sir Robert Walpole is generally regarded as the first man to hold that post. Robert Harley was an astute (and ruthless) politician and successfully negotiated the Treaty of Utrecht, which brought to an end Britain's involvement in the War of the Spanish Succession. Robert Harley fell from favour on the accession of George I and, for a time, was imprisoned in the Tower of London. Robert Harley was also an important patron of the arts. He was instrumental in furthering the careers of both Daniel Defoe and Jonathan Swift. He amassed an immense library of important literary manuscripts which, on his death, were acquired by the British Museum and formed the foundation of the British Library.